"Fishing Unlimited" has been in business since 1976. We are a fly-out fishing lodge located in the heart of Lake Clark National Park in the village of Port Alsworth. 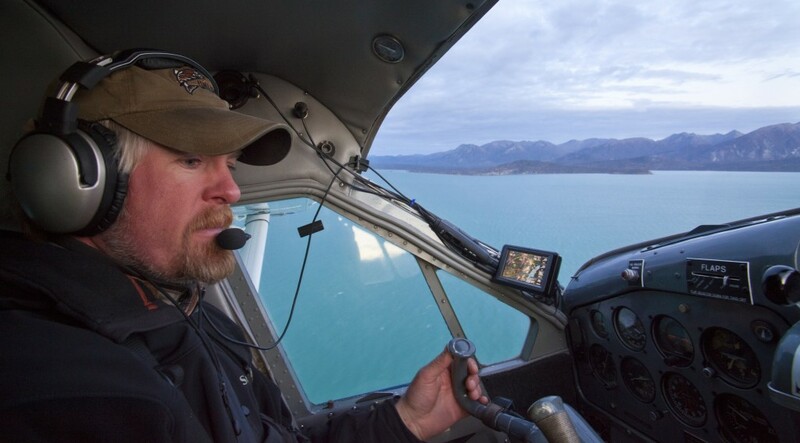 We operate 4 float planes and cover over a 30,000 square mile area of fishing and flight-seeing heaven including Bristol Bay watershed, Katmai and Lake Clark National Parks, and the Illiamna/Kvichak watershed. We also have more than 20 boats placed on different remote rivers and offer a variety of float trips. I was born in Trondheim, Norway. When I was six my two brothers and I together with mom & dad moved to Qatar which is a tiny country next to Saudi Arabia. When I was seven my dad bought me a series of ten books written by Jack London. It was then that my Alaska dream started. I guess my serious dad was pretty adventurous too because at the end of our 5 year stay in Qatar he hooked a small travel trailer to our car and loaded up the family and drove back and forth between Norway and Qatar. Sometimes there were no roads and we'd take off through the desert and over sand dunes. Because my mom & dad took us boys to many countries around the world I think it made me look at the world and especially people differently than other kids my age back then. After Qatar we lived in France for a year. Lots of history there but not my favorite place! At 13 I was extremely thankful for being back in "the old country"where I pretty much fished, hunted and skied every chance I got. Every birthday I would get an annual subscription to a Norwegian outdoor and adventure magazine. In the back of each issue there were a few ads of fishing and hunting in Alaska and every now and then there would be an article by somebody who had been over there. My dream of going to Alaska was so big that after the military I couldn't take it any more. I had saved up enough money to go to flight school in the States and in the spring of 1991 I packed my bag and went to Tennessee where I did my flight training. The following spring I headed for Alaska with nothing more than a fresh pilot license, a map of The Last Frontier and a bag full of dreams. My first real flying job was for a sport fishing camp in King Salmon. It was here that I met my wife who sang in the local bar for all the cannery workers, sports fishermen, commercial fishermen, hunters and pilots. In 1995 I got hired by "Fishing Unlimited" as a pilot-guide and have been there ever since. My wife and I have a son and a daughter that we raised in Port Alsworth. Even though our tiny cabin didn't have running water or indoor toilet they both tell us that they had the best childhood a kid could ever have! I spent two winters in a wall tent cutting trees that I floated down Lake Clark in the spring for the log cabin that I had always dreamed of. In 2000 the previous owner announced that he was selling the lodge property to an organization that works with wounded veterans. I had planned my life and future around Fishing Unlimited so I made up my mind that I was gonna continue the operation. I knew a little bit about flying a bush plane and catching fish but I didn't have a clue on how to run a business. Borrowing the money to buy the old Beaver that I had been flying is the scariest thing I've ever done! But here I am - thanks to Bristol Bay, Alaska being the place that it is, the best crew in the world, and some really good friends, in a new lodge that we built with the trees that I cut. It's my 24th season as pilot-guide for the lodge and my 9th season as the owner. Dave Tyson, our chief pilot-guide, is celebrating his 40th season with the lodge this year. Several of our guests have fished with us every year for more than 30 and the majority have been coming for more than 20 years. We all feel that the fishing is as good or better than it's ever been! 5. Favorite species of fish to catch in Bristol Bay & why? I love catching Salmon when I'm not guiding because of how good they taste and how good they are for you. Growing up in Norway I have eaten many a farm raised Salmon. I think I'm well qualified when I say that there is just no comparison between the two. The firm deep red meat of Alaska Sockeyes compared to the soft, light orange meat of the farmed fish.... No comparison!! When it comes to sport fishing and guiding my favorite is the Bristol Bay Rainbow Trout.The beauty and the power of these fish are like nothing else! Actually, it doesn't matter what size they are, you can't beat them!! I also love Grayling. They're gorgeous and almost always eager to take a small dry-fly; plus they live in some of the most beautiful, crystal clear little mountain streams, where nobody else is tough enough to make it. 5. You recently chose to take make a statement by taking your No Pebble Mine message to the air with some sweet graphics on your Cessna 206, what compelled you to go with the new look? I'm doing similar graphics to our other planes. My hope is that more people will get curious and learn more about the risks that we're up against by big mining companies wanting to come and mine this area. This is my way of helping protect Bristol Bay from Pebble Mine and other mining companies. Hopefully more people will become aware and understand why we can't have open pit mining going on right in the heart of the most important Salmon fishery on the planet. Well, I don't understand why we need to even spend the time and money to do the research that they're doing to see if they can build a "safe" mine here!!! I'm not against mining at all. We need copper and we need gold. We need mining. I understand that! I just think that this is possibly one of the worst locations you could ever put one of the biggest open pit mines in the world! Right at the headwaters of some of the most important Salmon spawning grounds that exist?!! Millions of Salmon are born here and return year after year. We have crystal clear streams here. We have Brown Bears running all over the place and eagles flying overhead! I've been to a lot of places around the world and I have not seen anything that comes even close to what this place has to offer!! It's a very bad idea and it's just f***ing stupid!!!! Excuse my Norwegian. I don't know how else to put it! You don't need to be a rocket scientist to figure that one out! Think about this: Would you need or want a bunch of "experts" to do a bunch of research to find out if putting a casino in your neighborhood could be done safely? Of course you wouldn't! It's just a bad idea!!! As I mentioned earlier. The fishing in Bristol Bay is as good or better than it ever was. There are lots of people that live subsistence lifestyles here like their people have done for many generations before them. It's what they do and who they are! The commercial fishing and sport fishing industry provides work for thousands of people and creates millions in revenue. The resource is renewable and is being managed very well. There's absolutely no reason that I can see why it couldn't stay this way for many generations to come. I don't know how many times I've landed on a remote river and heard one of my guests say "Martin, if I don't catch a single fish today, this has been the best day of my life!!!" That's because we have unspoiled wilderness here with no roads and infrastructure like the places that they came from. Even if Pebble Mine didn't kill a single fish it would change this landscape forever. It would never be the same again!! My sense of hope comes from all the people who see the real risks and the true value of Bristol Bay, and are taking action to protect and preserve it. It scares me that there are also people willing to risk Bristol Bay's renewable resource for short term gain. I would like to reemphasize that I'm not against mining. I just can't think of a worse location!! !